The College is proud to announce that its Workforce, Community and Economic Development division now offers alternative high school graduation pathways to help students succeed in today’s competitive workplace. Ohio high schools provide a collective look at a variety of opportunities for students to learn about career, education and training options. 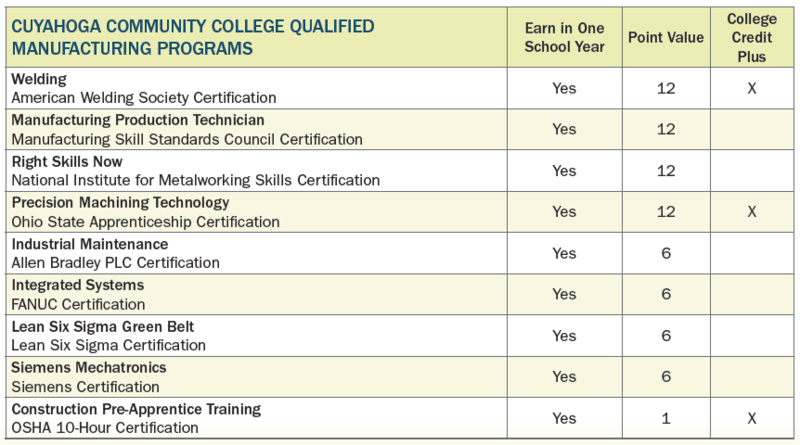 Whether a student’s aspiration leads them to college, a job training program or the workplace, a high school diploma is simply the doorway to self-sustainability. A total of 18 graduation points across all end-of-course tests. A remediation-free score on the ACT or SAT. A composite score of 13 on the ACT WorkKeys assessment and an approved industry-recognized credential. Within the high school curriculum. perform day-to-day tasks in their chosen field. In short, students learn about work, through work and for work. Schools get credit in the Prepared for Success measure on the report card for students who earn approved industry-recognized credentials. Including industry credentials in this component places an emphasis on students’ career readiness. credentials help employers validate the knowledge and skills of potential employees and saves valuable time in assessing the skills of job applicants. Tri-C is committed to addressing the technical gap in this region by continuing to introduce and engage youth in grades nine through 12 in cutting-edge STEM instruction. Tri-C fosters strategic partnerships with programs specifically built around the needs of employers within the industry. Students learn new training systems that prepare them for the future workforce and the latest technologies. We offer many of the qualified, industry-recognized credentials for the demanding careers in Northeast Ohio and provide field experts as instructors to train and prepare students for the certification exams.